Roll out the carpets and pitch your tents for the Caravan has come to town. 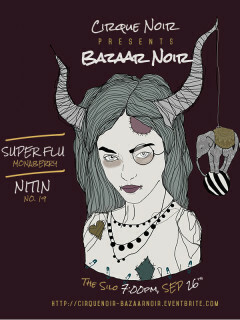 Bazaar Noir will awaken all your senses and delight every desire. Imagine the scent of open fire against the cooling fall air, the vision of artiste painting with wild abandon, the feel of worldly jewelry adorning your hands and feet, and most of all the sound of our Ring Leaders Super Flu- Monaberry and Nitin - No. 19 leading us through the night.